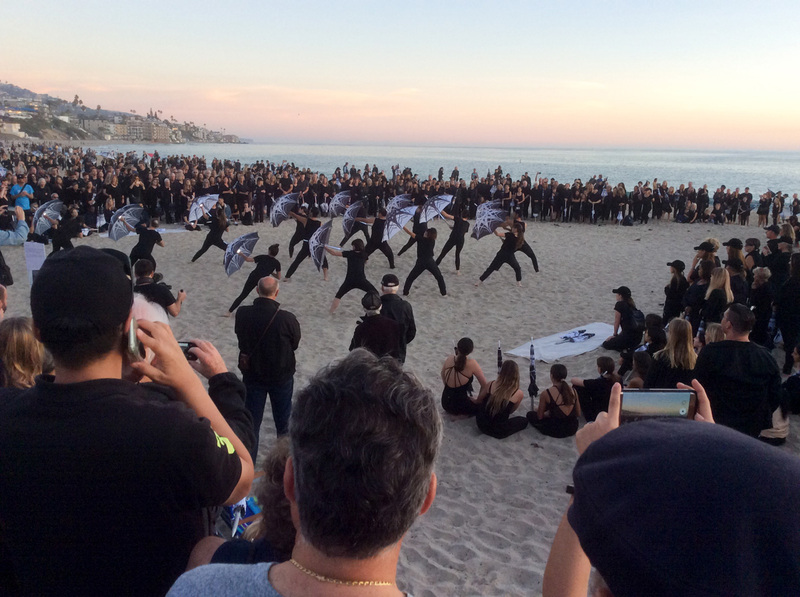 With a cast of a thousand and as many gathered to watch, the Shoreline Project fulfilled its much-hyped promise as the centerpiece of Laguna Art Museum’s annual Art & Nature Fest. My own preview contributed quite passionately to the high expectations, predicting “a mythic event,” “a glowing antidote to these darkly divided times.” And guess what? It wasn’t the least disappointing. Well, except that I wish I had signed up to cavort in Elizabeth Turk’s well-prepared and spontaneous art happening rather than observe, as delightful as that was. The steps at the north end of Main Beach was a great spot to take it all in: the black-clad participants and their prized parasols; the two drones filming it all above our heads, the beach and over the sea; the ever-growing crowd in the glow of the setting sun. A huge circle formed for the ASSEMBLY’s piece, choreographed by Lara Wilson, that kicked things off. The image of all the dancers striking an archer’s pose sticks in my head. 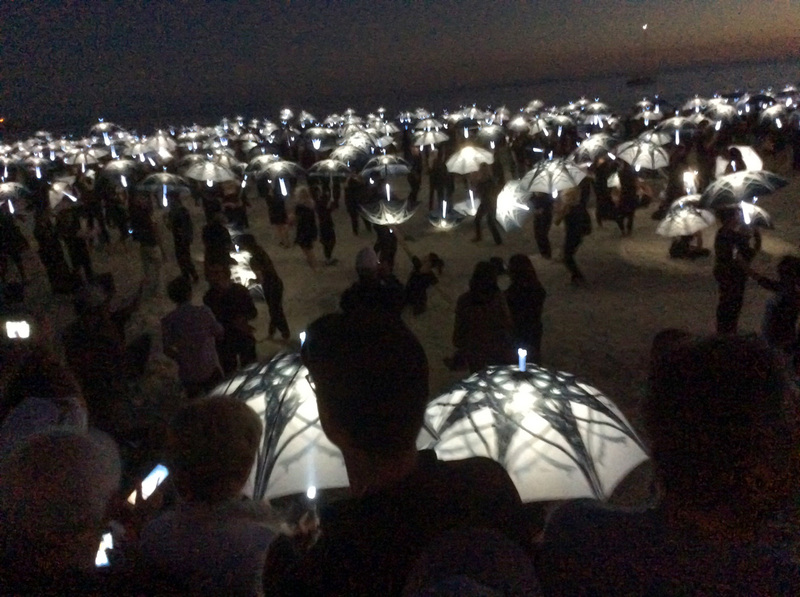 They swept up the sand and animated the umbrellas in multitudinous ways, giving volunteers ideas for the improvisation to come. 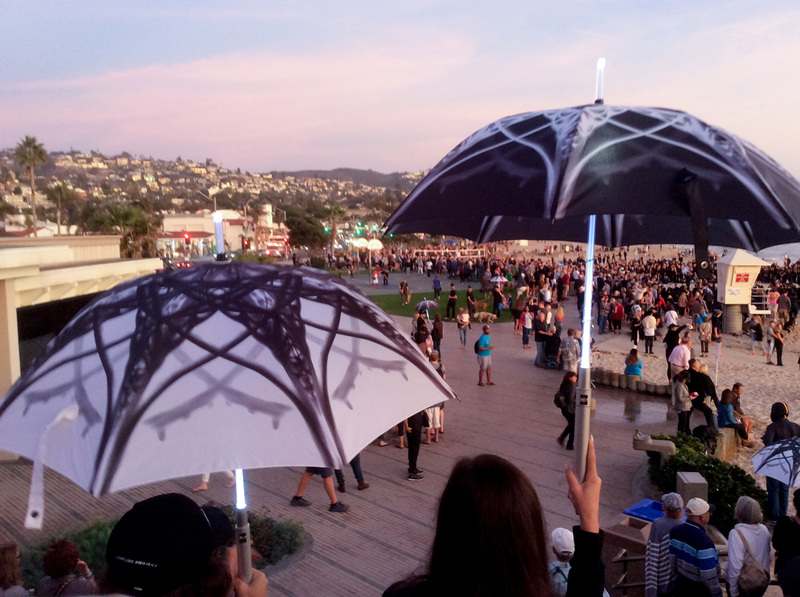 The powerful percussion of the Laguna Drum Circle mixed with the sounds of the ocean and energized everyone to light up their X-rayed-mandala umbrellas. A thousand community volunteers came together in the dusk like dancing jellyfish on a bioluminescent shore. Treat yourself to the two-and-a-half minute video on the Shoreline Project’s website for a capsule of the event—but mostly for the astounding drone footage. The drumming didn’t let up as the umbrellas came together, repelled one another, flipped upside-down, blinked, spun, twirled and swept in great arcs as dusk turned to dark. When you caught glimpses of faces lit by the LEDs under the canopies or by the glowing shafts, you saw all ages, all smiling. Later in town, with their umbrellas rolled up and secured, those lucky enough to have a Turk piece of art were still joyful. Here’s to Turk and her collaborators for dreaming up such a spectacle—and reminding us all to go toward the light while, just maybe, keeping our expectations a little in check. Always enjoy your writing. Very descriptive and easy to visualize. Were you associated with the CUCKOO’S NEST in the early eighties? Or were you still a child? Used to play there , just wondered. Nice article.